Today, Yahoo announced the public disclosure of three National Security Letters it received from the FBI—an acknowledgement that’s happening for the first time due to the reforms of the USA Freedom Act, according to the company. Previously, the letters—received on April 2013, August 2013, and June 2015, respectively—had been subject to non-disclosure agreements set forth by the FBI. But under the USA Freedom Act, which was passed in June 2015, the FBI must now periodically reassess nondisclosure orders “to determine necessity.” In early May, Yahoo received letters from the FBI stating that the past gag orders were no longer needed. As part of its “commitment to sharing as much information as we legally can regarding government data requests,” Yahoo went and published redacted versions of the letters, which all included requests for information on specific Yahoo users. 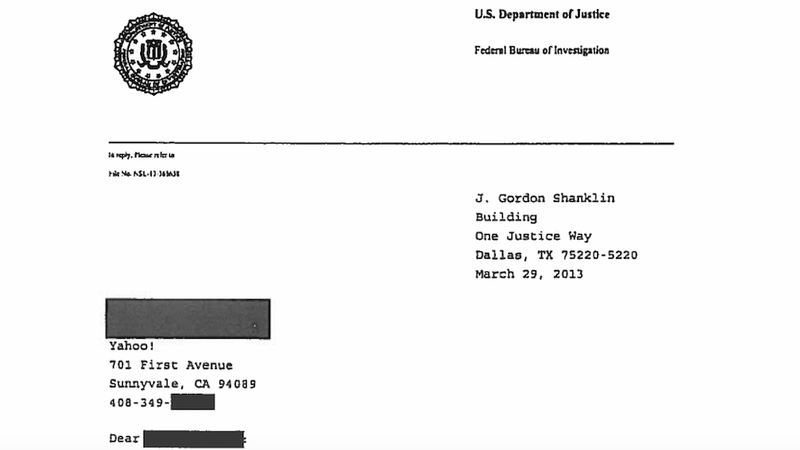 There’s nothing much of interest in the letters themselves—any juicy information was redacted—but it does provide some insight into how the FBI collects information, which companies had previously been unable to discuss publicly. In the future, Yahoo said, its Transparency Reports will include the number of NSLs it receives if the FBI deigns their nondisclosure clauses unnecessary. Of course, the clauses set forth by the USA Freedom Act are just a small step, so don’t expect any earth-shaking disclosures anytime soon. But at least Yahoo’s disclosures appear to be a small step in the right direction. Clarification 5:45 pm: An earlier version of this post noted that the disclosure was the first of its kind. In fact, it is the first of its kind as a result of the USA Freedom Act. Nondisclosures have been struck down previously as a result of legal action. We’ve also added statements from both the FBI and Yahoo.